Craft weapons and armors, save your country, make money and be rich. 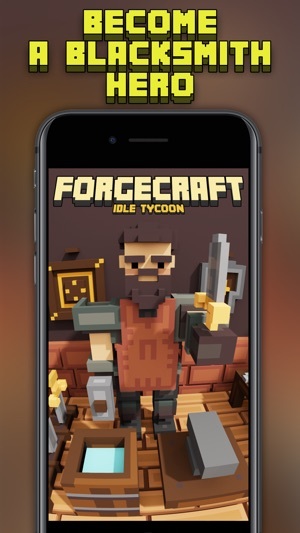 Download ForgeCraft – Idle Tycoon, a blocky pixel graphics idle clicker game for free and make a fortune. 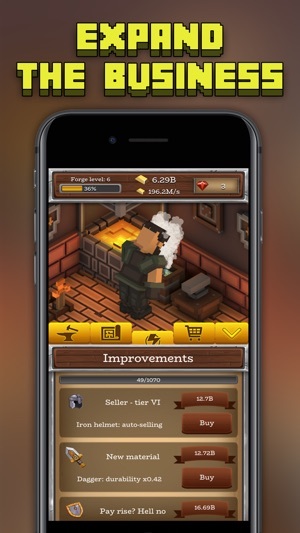 In this crafting and building business tycoon you can be the greatest blacksmith and help your country to survive! 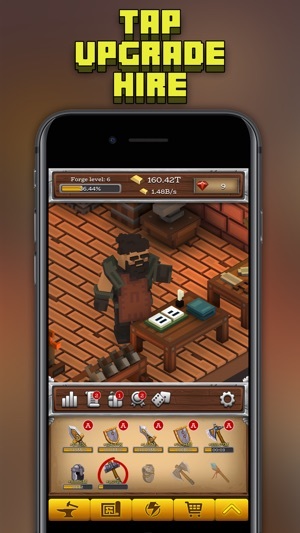 Being blocky blacksmith it is your duty to make weapons and armors to save the country. Do it by crafting / building / forging, you can craft block 3D weapons and armors like dagger, sword, buckler, pavise, etc. Sell these weapons, become a billionaire and a clicker hero! Now, what are you waiting blocky blacksmith? 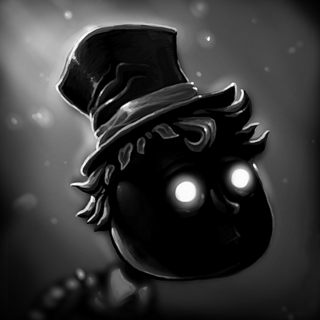 It’s time to earn profit by selling the weapons, armors to be a hero and a millionaire. 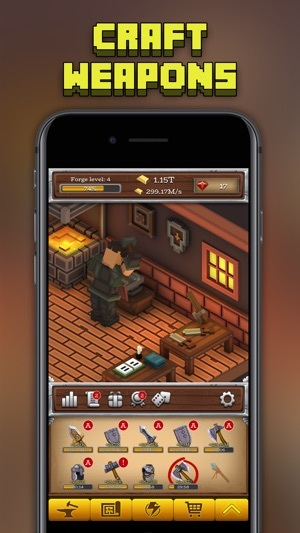 Are you ready to become a rich pixel blacksmith and the clicker hero? 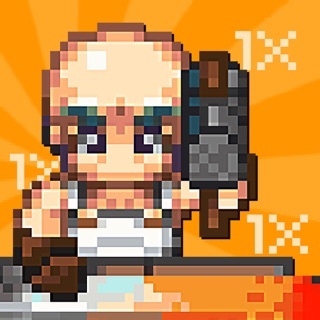 Just download and install this forging idle clicker game right now. 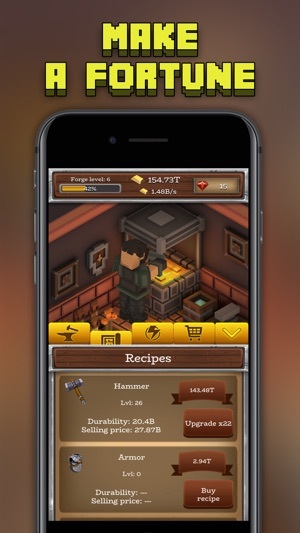 Real Blacksmith’s adventure is waiting for you here! One of the best simulation games of 2017! Start the exploration now and become the best business tycoon. Download now! Game is pretty addictive. After my first prestige, I was ranked at #52 in the leaderboard. Decided to prestige again to she what rank that would make me, now I’m on my 11th prestige... Only 2 recommendations is to fix the bug where the whole game crashes when playing the games like runner. And also when you can receive gold for watching an ad then it makes to wait to watch the ad because the “Ad is not ready”. The first time I saw that I almost deleted the game. I mean it’s free advertisement, which I AGREED to watch in the first place knowing that it ad will be 30-45 seconds long. I don’t want to be told to wait.. I do like this game. It has bugs though. Crashes on mini games every single time, has ads that have no “X” to close them and sometimes I have to watch videos twice because they don’t take the first time for the rubies or cash. 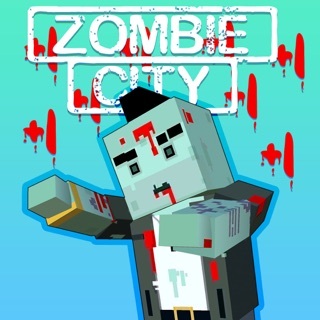 Game is fun but I don’t guess they will ever fix the issues with it crashing during the mini games. I see that it has been 9 months since the last update so I guess it’s time for me to abandon the game like the developers have done with this app.